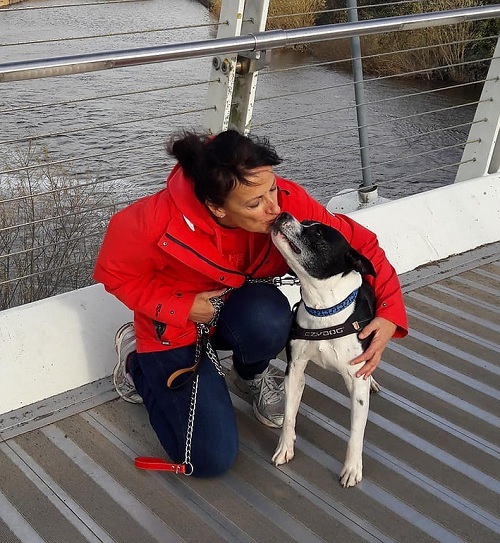 20/3/19 – Lovely little Lewis has been adopted! 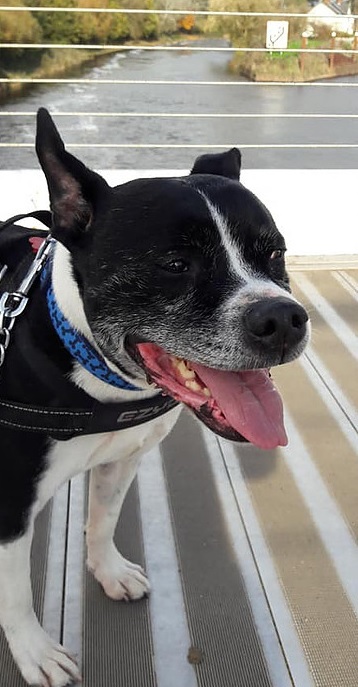 Cute little 9-year-old Lewis is an adorable boy who is with Senior Staffy Club, and is now in a foster home in West London. 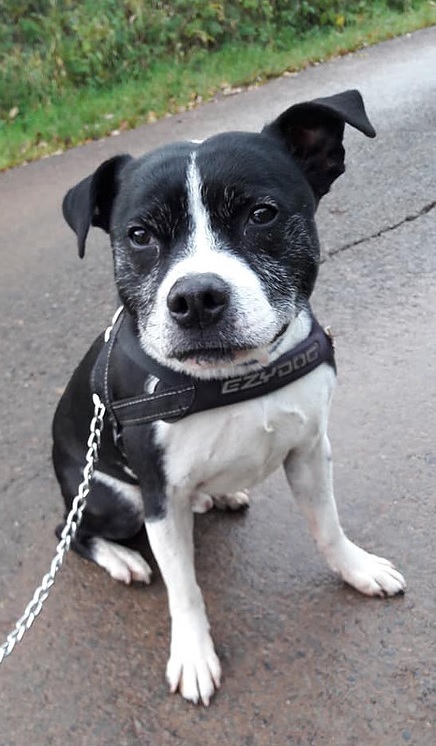 Lewis is very loving and affectionate but needs a special family to take care of him because he gets worried very easily. When he gets anxious he likes to chew things, especially wood, so Senior Staffy Club’s behaviourist, Charlene, is trying to teach him the difference between wooden toys and wooden bits of houses! For this reason he needs someone who can be home with him a lot and is happy to work up to leaving him gradually. Lewis is very clean in the home. 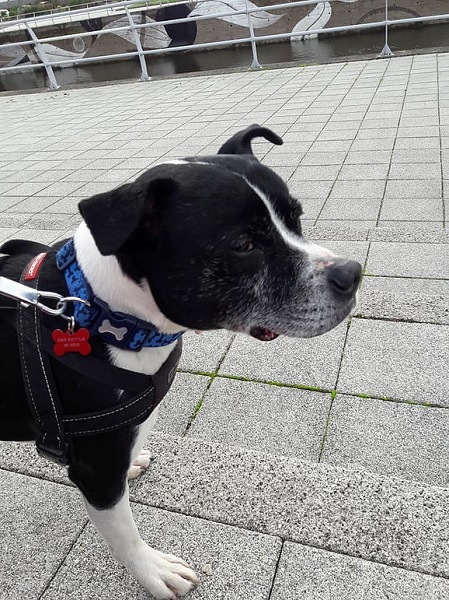 Lewis’s old family had him from a puppy, but they have moved a long way away and, due to his anxiety and not liking being away from people, they thought the journey and quarantine would be too much for him. Lewis is in great shape for his age and loves nice long walks. He is a bit noisy in the car, and really doesn’t like going to the vets, but behaviourist Charlene is helping him get used to the vets. 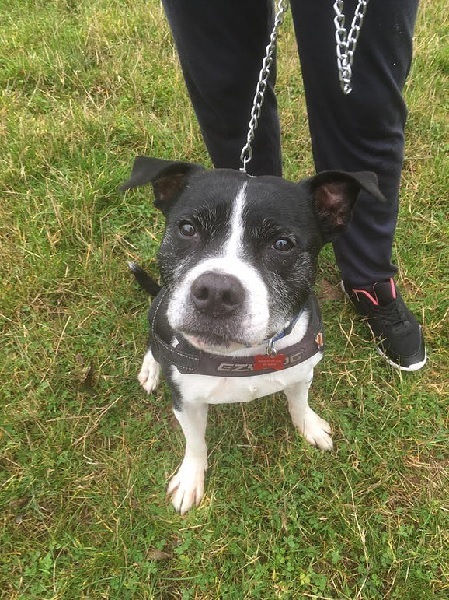 Lewis has lived with a girl dog before and walks well with the other dogs at kennels, but his previous family said he could be a bit fussy and OTT with other dogs. He could possibly live with a calm, friendly female dog if they liked each other when introduced. Lewis needs a home without cats. He can live with children aged 12+. Could you offer this cute and lovable little chap the home he needs? Please mention that you saw Lewis on the Oldies Club website.